Vandwelling, a portmanteau of the words "van" and "dwelling", is a lifestyle of living full- or part-time in a vehicle, typically a van that has been modified with basic amenities, such as house batteries, solar panels, a bed platform, some form of toilet, sink and storage space. Some vandwellers live this lifestyle by choice while seeking freedom, self-sufficiency, and mobility without paying for conventional stationary housing, while for others it may be one step from living on the street or in a shelter. An idealized version has been popularized through social media with the hashtag #vanlife. Although the term vandwelling implies living in a van, many types of vehicles may be used for permanent, mobile living arrangements, including conventional buses, school buses (called skoolies), campervans, RVs, travel trailers, or mobile homes. Even SUVs and larger station wagons can be used for long-term living. The history of vandwelling goes back to horse-drawn vehicles such as Roma vardo wagons in Europe, and covered Conestoga wagons in the United States. One of the first uses of the term "vandwellers" was in the United Kingdom Showman and Van Dwellers' Protection Association, a guild for travelling show performers formed in 1889. Shortly afterwards in 1901, Albert Bigalow Paine wrote The Van Dwellers, about people living on the verge of poverty having to live a nomadic life in horse-drawn moving vans. After the introduction of motorised vehicles, the modern form of vandwelling began. The vandwelling lifestyle can allow for significant autonomy and a lower cost of living than having a mortgage or lease as in a more traditional living arrangement. Assuming they have the means, vandwellers are free to travel as much or little as they would like. Some vandwellers choose to remain in one general area, and work full-time or attend school while living in their vehicles. Others travel full-time while working remotely via the Internet or finding seasonal or short-term employment opportunities in various locations. 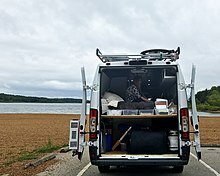 Since vandwelling consists of living in a vehicle with a footprint no larger than a parking space, there is usually little to no space for bathing or doing laundry. Some vandwellers use gym, campground or truck stop showers, or cleaning wipes when showers are not available. For washing clothes they often use a bucket and the van's vibration to agitate the water, or will go to a laundromat or use friends' or family members' washers and dryers; usually in exchange for work, money or security, like when the homeowners are on vacation. Vandwellers will usually go to places close by for weekends and holidays which would be anything people living in conventional housing would do in their free time. Converted Ram Promaster 3500 with four 100 watts solar panels. An idealized notion of the van dwelling lifestyle is presented on the photo-sharing site Instagram using the hashtag #vanlife. The hashtag was first used and popularized by a photoblogger named Foster Huntington in 2011. Since that time, a romanticized vision of the vandwelling lifestyle has continued to flourish on social media. By October, 2018, the #vanlife hashtag had been used on more than four million images on Instagram. Many of the photos include idyllic natural scenery, either framed by the open back doors of the van, or with the van prominently visible in the landscape, or spotless, stylized interior views of the living space. The people pictured in the images tend to be young, attractive and outdoorsy, and the photos are often set in natural areas, particularly in the Western U.S..
#vanlife is a form of adventure tourism that involves a van that is livable and self-sustained that can access remote areas to recreate in. #vanlife is a converted a motor vehicle that can be used as a full-time home or a recreational vehicle, i.e some people are weekend warriors, some people on short-term adventurers and some people are full-time travelers. #vanlife is a sub-culture of nomadic individuals who are embracing minimalism on a journey to reassess what is truly important for a happy and balanced life. #vanlife is a form of ecotourism or eco-friendly living by goals to reduce carbon emission, i.e by using solar panels, minimalistic lifestyle, waste. #vanlife is a social movement to try and get people more motivated to make small changes in their life to lessen these resource and energy demands. In the U.S., individuals who lack a permanent address and stable living situation are technically considered homeless. This includes vandwellers, whether they are living in a vehicle by choice — seeking an unconventional lifestyle, for example — or by necessity. Many municipalities have laws prohibiting overnight parking and/or sleeping in vehicles. Even in such areas, some retailers, such as Walmart and Home Depot, often allow people in RVs and other vehicles to stay in their (private property) parking lots overnight. Van conversions offer a wide range of options. A conversion can be as simple as a folding bed in the back, with only the engine battery for power, to vans that function like micro-apartments on wheels with complex power setups, a kitchenette, and even simple plumbing. Vehicles like the Volkswagen Westfalia, a regular passenger van, or a cargo van, can be modified for day-to-day living by a professional conversion company. Upscale van conversion can provide most of the amenities of a conventional home including heating, air conditioning, a house battery system, a two-burner stove, a permanent bed, and other conveniences that make the vehicle fit for full-time living. School bus modifications are also common among vandwellers. Vandwellers do not have a permanent address, so they will use mail-forwarding services so they can have a real address, and not just a P.O. Box. It is useful to receive packages and other mail. The service works by receiving mail, then mailing it out to any address where the vandweller can access. Vandwellers pay their bills and conduct other business online (often through public wi-fi), and may have unlimited cellular data plans for their mobile phones. Vandwellers will usually work seasonal jobs, ranging from national parks to warehouse jobs. Some vandwellers work only part of the year then use the money earned to travel. Vandwellers have been known to be digital nomads who work remotely from workplace or have a job that does not require working at location. Some of them are self-employed entrepreuners, photographers, youtubers, writers or translators, or do arts and handcraft-related work. Their job sometimes can be related to travelling or work done at location wherever they currently are. Some of them work normal day jobs and occasionally travel. Some cities in the United States, such as Los Angeles, have municipal codes about times and places where somebody is authorized to live in a vehicle. Jamie Dimon (Enigmatic Nomadics) - A former vandweller who currently lives in a skoolie. Foster Huntington, originator of the #vanlife hashtag (currently living in a treehouse). Alex Honnold - professional rockclimber. ^ "Battery Isolator". www.vandwellers.org. Retrieved 3 October 2018. ^ "100W Solar Panel Install". MTB Van Life. 4 June 2018. Retrieved 3 October 2018. ^ "The Rig(5/30/13, updating Nov 2017)". SwankieWheels. Retrieved 3 October 2018. ^ "Toilets". www.vandwellers.org. Retrieved 3 October 2018. - "Sanitation". SwankieWheels. Retrieved 3 October 2018. ^ "Introduction to the History of the Showmen's Guild of Great Britain and the Regional Divisions". University of Sheffield. Archived from the original on 17 July 2011. Retrieved 3 October 2018. ^ Paine, Albert Bigelow (1901). The Van Dwellers (Ebook). New York: J. F. Taylor & Company. Retrieved 3 October 2018 – via ManyBooks. ^ "Bathing". www.vandwellers.org. Retrieved 3 October 2018. ^ "Laundry day". www.vandwellers.org. Retrieved 3 October 2018. ^ Heyden, Dylan. "Foster Huntington's New Book Is a Collection of Van Lifers' Stories that Continue to Inspire Him". The Inertia. Retrieved 1 November 2018. ^ "#vanlife hashtag on Instagram". Instagram. Retrieved 1 November 2018. ^ "#Vanlife, the Bohemian Social-Media Movement". The New Yorker. Retrieved 1 November 2018. ^ "What is the official definition of homelessness?". National Health Care for the Homeless Council. Retrieved 1 November 2018. ^ "Los Angeles Municipal Code (LAMC) 85.02 – Vehicle Dwelling". City of Los Angeles. Retrieved 3 October 2018. Bergstein, Rachelle (23 September 2017). "America's forgotten men and women are becoming 'vandwellers'". New York Post. Retrieved 3 October 2018. Green, Penelope (31 January 2018). "The Real Burning Man". New York Times. Retrieved 3 October 2018. Harris, Heather (05 December 2016). "The Road is My Home:" Reflections on Vandwelling Culture in the United States. [email protected] State University. Retrieved 19 February 2019.